1. Preheat the oven to 200°C (180°C for fan assisted ovens), gas mark 6. Lightly brush the tortillas with some of the oil. Place on an ungreased baking sheet. Bake for 5 minutes or until the rims of the tortillas are lightly browned. Leave to cool. 2. Meanwhile, heat the rest of the oil in a large non-stick frying pan over a medium heat. Add the beef and cook for 5-6 minutes, stirring frequently until browned all over. Stir in the taco seasoning and water and cook for a further 10 minutes, stirring occasionally. 3. 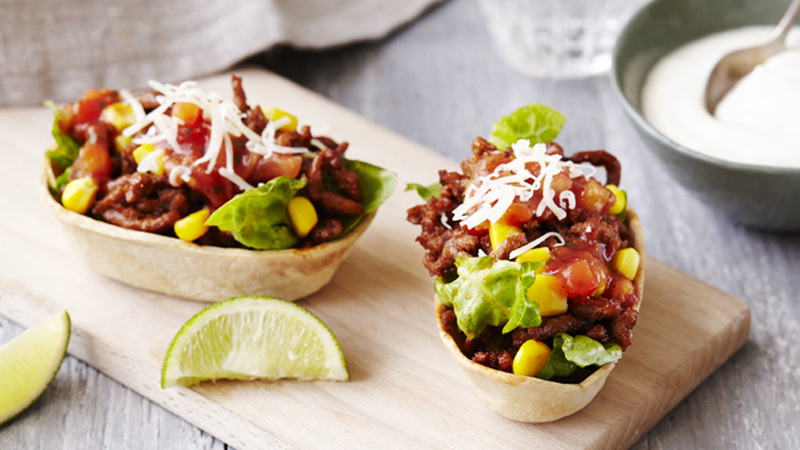 Divide the lettuce between the tortillas and top with the beef mixture, sweetcorn, salsa and grated cheese. Garnish with coriander sprigs and serve with soured cream and lime wedges. Add extra flavour to the tortillas by sprinkling with a little chilli powder after brushing with oil. Replace the Cheddar with crumbled feta cheese for a tangier taste.